Parody songs have been around for years. Stan Freberg made a handsome living out of it for many years in the fifties and sixties but The Barron Knights are probably most famous in the UK for covering currents hits of the day with alternate and, sometimes, amusing lyrics. In the early-eighties, almost of the blue, came another in the shape of Star Turn on 45 Pints. 1981 was the year of the medley with no less than 27 different medley’s making the chart. The most successful was Star Sound with various versions of Stars on 45. Steve O’Donnell, Colin Jennings, J. Vincent Edwards came together and jumped on the bandwagon with the song Starturn On 45 (Pints) which was a medley of various songs from all different era’s and included I Will Survive, You Are The Sunshine Of My Life, Hit Me With Your Rhythm Stick, Japanese Boy, My Way and Green Green Grass of Home, a very odd mix indeed! It peaked at number 45. 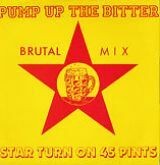 By 1982 the medley craze had pretty much gone as only five medley’s charted that year, so just when we thought it was safe, Starturn on 45 Pints popped up again seven years later and this time taking the Mickey, quite accurately, out of the working men’s clubs in the north of England. They chose to cover a number one hit from the previous year – M/A/R/R/s’ Pump up the Volume and called it Pump up the Bitter. It was based in a fictitious Whitley Bay Social Club and featured the characters Hampton Cummings (voiced by Jennings) who appeared as the resident singer called Star Turn who was introduced nightly by the Geordie chairman Albert Charlton (voiced by J Vincent Edwards). Often wanting to get a piece of the action Albert often added spoken accompaniment and occasionally played the spoons too. Edwards was the more experienced one having released a number of singles in the late sixties including Run to the Sun and Thanks both in 1969 and Who Are My Friends in 1970. He then appeared in the London stage version of Hair but by the mid-seventies he tried his hand to songwriting and wrote and recorded his own songs like Wonderland (1974), Worst That Could Happen (1975) and Just for You (1976). In 1975 one of his songs was picked up by the United Artists label and given to one of their signings and became a top 10 hit, that song was Right Back Where We Started From by Maxine Nightingale. He also wrote her only other hit, Love Hit Me 18 months later which reached number 11. Edwards said, “The original inspiration for Star Turn was based on my early experiences of performing at the working men’s clubs in North East England.” He has since written music for film soundtracks including Down And Out in Beverly Hills and the Disney movie Cleopatra. As for Jennings he’s also written album tracks for Cilla Black and The Hollies and was a member of the prog rock group The Greatest Show on Earth. Steve O’Donnell died on 4th August 1997. Pump Up The bitter included amusing lines like; The names have been changed to protect the committee, can someone help Mrs Patel out, she having one of her funny turns and the chorus line ‘pump up the bitter brew it, brew it. It also includes a samples of Tony Blackburn saying, ‘What do you think of this gang, is this a load of garbage.’ I have to say Tony, having listened to it again I think he’s right! Although they haven’t graced our chart since, they continue to release parodies, but it’s unlikely with today’s music scene they will ever grace them again, but if you are desperate to hear something recent from them check the rather dire cover of Franz Ferdinand’s Take Me Out. Apparently their entire catalogue is available on iTunes, but I haven’t had the bottle to look for it. A quick look at Edwards’ website told me that he’s recently written 22 new tracks and has a new album out called Keep Your Dreams Alive. The site also states: ‘He is in great demand for TV shows throughout Europe and also performed this September at the Café Royal in Picadilly (sic) – Lodon (sic) with his good friend and songwriter Jimmy Webb.